My friend is always telling the story about how we met. He’s such a broken record. My wife keeps reminding me to buy milk. I wish she would stop being such a broken record. Charlie’s girlfriend is always asking him to take her out dancing. That’s all she wants to do. What a broken record she is! I don’t like that TV personality because he always talks about the same things. He needs to stop being such a broken record! My mother is a broken record about marriage. She’s constantly asking me when I’ll get married! As you can see from my examples, we often put “such a” in front of the term “broken record”. 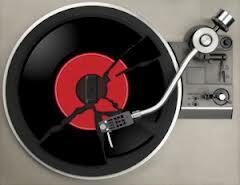 As you can imagine, we use “broken record” to talk about people who repeat the same things all the time because if a vinyl record is scratched, it will repeat the same thing again and again.